With over 15 years’ experience in restoring Natural Stone flooring and other surfaces, the team here at Infinity Flooring can hone, grind and polish your Terrazzo floors to bring them back to looking as good as new! At Infinity Flooring, we have a team of experienced and skilled Terrazzo Floor Cleaning and Polishing contractors who are able to offer a variety of different treatments and solutions, with an ethos which puts the customer firmly at the centre. We can transform your Terrazzo Floor back to its best with our range of cleaning, polishing and restoration services. Terrazzo is far too often found hidden beneath carpeting before being revealed by accident. This can leave it riddled with holes from carpet tacks and nails, and the flooring may have suffered substantial damage. Refinishing and restoration can help to eliminate this, bringing the surface up to snuff before polishing. If your floor has suffered from being covered in carpet, don’t despair; there are steps which can be taken by the experts to restore condition. This includes using filler, or filler with aggregates (tiny flecks of marble), to seal any cracks or chips before moving onto other treatments. Matching filler to floor requires the eye of a professional to create a seamless final product. Terrazzo is particularly prone to cracking, so it’s important to thoroughly repair any weak points in the flooring surface. Honing can be ideal for filling out any remaining damage to your floor. It can be used to blend filler with the surrounding area, creating a seamless finish. After your surface has been filled and honed, a final terrazzo floor polishing will integrate it flawlessly with the surroundings, bringing up the natural shine of your Terrazzo floor and creating a smooth surface. There are two main options with terrazzo: a velvet-like satin/matte finish or a seriously shiny gloss. Terrazzo Sealing provides a protective coating between the stone and the rest of the world. This can reduce the damage caused by scratches and scuffs, as well as any discolouration which may arise from cleaning or chemicals. Terrazzo Stain removal is tricky for any natural stone, and so is a task best left to the professionals. Before treating your floor in any way, it is important to start with a thorough Terrazzo deep clean and stain removal. This allows any further treatments to occur on a blank surface, giving them an opportunity to provide full impact. A Terrazzo clean can also be an ideal way to freshen up the surface between treatments. Spotting and addressing repairs early on could save you time, money, and effort in the long run. It is important to catch any issues such as Terrazzo cracks or chips before they have a chance to develop and to make repairs quickly. Not only do these flaws spoil the look of your floor, but they can also cause further, potentially expensive, damage. The last thing you want is your freshly-treated tiles to be let down by grubby grout. 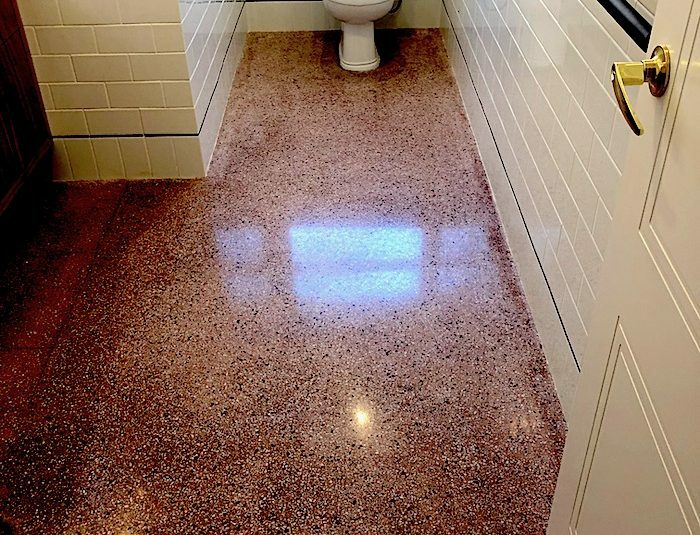 Terrazzo Grout restoration provides a facelift, offering a new, fresh, and clean feel easily, as well as helping to preserve and extend the life of the grout.